In September and October, Creative Feel ran a competition to find a unique and interesting image for our November cover. And we found it! 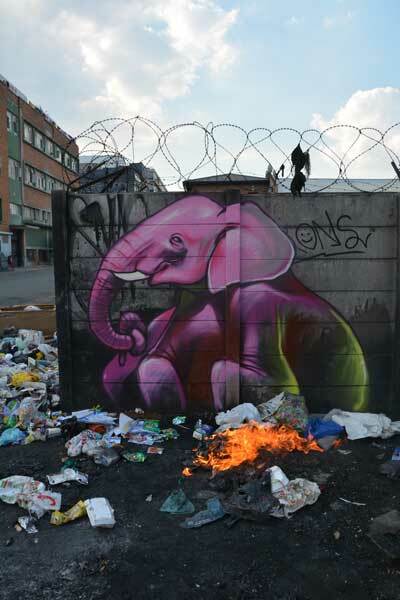 Cale Waddacor’s photograph of one of renowned graffiti artist Falko One’s signature elephants in positive pink and green, juxtaposed against barbwire and rubbish, speaks to the essence of what makes Joburg unique. Among the abandoned buildings and littered streets of the City, art is being used to revitalise, rejuvenate and bring positive new life back in. Cale Waddacor is a creative from South Africa with a degree in film and a keen interest in the visual arts. He has an array of hobbies and interests, from music and photography to street art and urban exploration. Waddacor is an avid book collector, currently obsessed with photobooks. Waddacor is one of South Africa’s top documentarians of the country’s street art and graffiti. Since 2011, he has run the website Graffiti South Africa to document urban art in South Africa, and has amassed a huge archive of knowledge and photography. 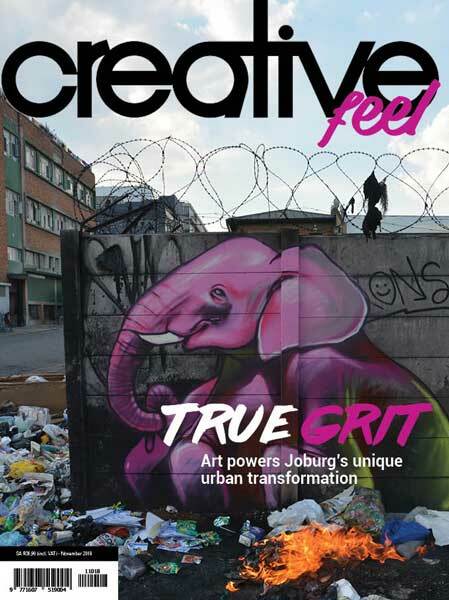 His book, also titled Graffiti South Africa, was published in late 2014 by Schiffer Books in the USA – the first of its kind to showcase South African graffiti on an international stage. More recently, Waddacor launched a film-only photographic platform, DEAD TOWN, which self-publishes a 96-page high-quality photo zine along with group exhibitions in Cape Town and Johannesburg. Falko One is one of South Africa’s most well-known and respected graffiti artists. With a career spanning almost three decades, he has been an integral part of the foundation and development of South Africa’s graffiti scene. He is heralded as a graffiti icon, not only for his style, but for establishing graffiti as a credible visual art form. Falko’s initiative started the first graffiti competition in South Africa in 1996, a concept that has been popularised the world over. Falko is widely recognised for his iconic elephant paintings that pop up in streets, townships and other random locations across the country. Rendered in his unique characteristic style and often situational to their surroundings these elephants have captured the imagination of all who see them. Falko regularly travels the world doing what he loves – making art. He has been commissioned for projects such as the backdrop for Nelson Mandela’s 79th birthday, work for the Cape Town 46664 concert and ad campaigns for major labels such as Adidas, Black Flys, MTV, Puma and Levi’s. He believes that graffiti is a dynamic social tool, and therefore dedicates a considerable amount of his time to community projects around South Africa. He participated in Red Bull’s Street Style tour in 2007, has worked closely with the British Council of South Africa, and government in facilitating workshops in disadvantaged communities, highlighting issues such as gender rights, racism, environmental awareness, and creating awareness about art as a form sustainability. Read more about the four other finalists that were very close contenders! Previous Article Previous Article “Juliet, Naked” coming to theatres this November! Next Article Next Article What’s your Joburg?